Call SF Black Car for East Bay limo deals without compromise. Enjoy the elegance of Lincoln and Mercedes town cars and sedans, a luxury SUV, or a stretch limousine equipped with all the amenities you would expect while a safe and polite chauffeur takes care of all the driving. Our affordable limo rental makes all that possible, from economical party limos, prom and wedding limousines to top-flight corporate limo service. 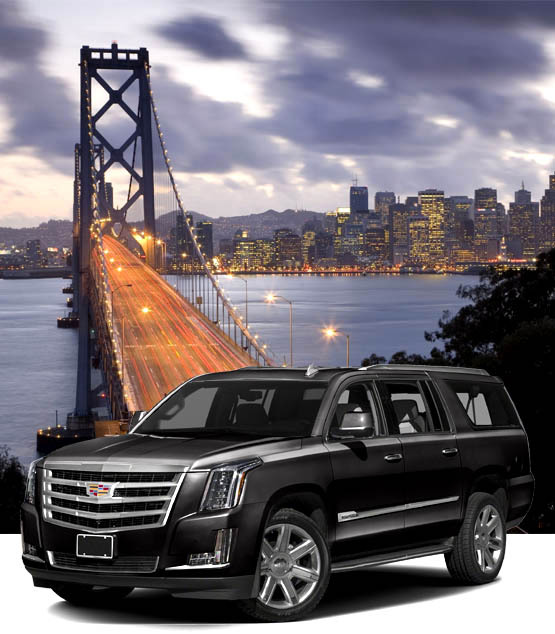 So call us for superb San Francisco East Bay limousine service at highly competitive rates. An East Bay area limo makes any event a memorable occasion Be sure to book well in advance for prom and wedding season to be assured of getting your first choice in vehicles. But don't forget San Francisco East Bay limousines when you're planning other occasions We've received rave compliments for our Napa and Sonoma wine tours. Customers also love our night-time city tours, whether for bachelor and bachelorette parties or just a night on the town among friends with East Bay limo deals. Whether for personal or business travel, our San Francisco East Bay limo services get you to and from SFO, SJC, and OAK airports stress-free and on time. We'll drop you off at the right terminal for departures and meet your arrivals at the baggage claim. Black Car's East Bay limo deals are perfect for corporate travel around town, including dining, event, and entertainment venues. Call SF Black Car Luxury Transportation for all Your east Bay area limo service needs.